spaceship to travel through space. LYC Bearing Group is the key bearing enterprise of China. In 1992, It undertook the task of producing bearing for key positions of space. Facing the foreign blockade, the staff carried on the sprit of self-reliance. Though without any reference materials, they made great progress on advanced technologies of bearing. 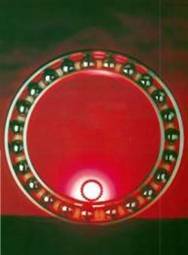 They successfully developed high precision LYC series of special bearings, which undertook the successful launching and retrieving of spaceship. For this, the group was greatly cited by the government.